Race-bikes are not usually considered style classics. As the name suggests, they are built to win races - not design awards! 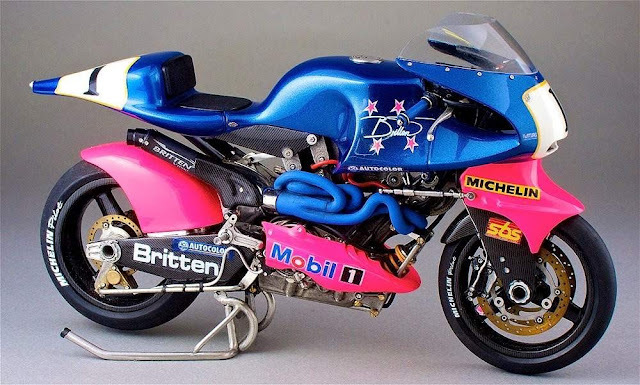 An exception to that rule was the Britten V-1000. Pop Art on wheels, its sleek curves were dual-purpose. Visually stunning, they also cut cleanly through air. Resulting in a top speed of 185mph! But, the V-1000's virtuosity went beyond aerodynamics. Its fuel-injected engine, too, was nothing, if not innovative. Take, for example, its computerised management system. Heady stuff, in 1995! All this applied research and development was by John Britten - and his tiny team of engineers. Tragically, Britten lost his battle with cancer at the age of just 45. We will never know, then, what future two-wheeled visions he would have dreamed up!